When it comes to wedding decorations, the options and the money it takes to pull off a “Pinterest-worthy” reception might seem overwhelming. But, we’re here to tell you that your wedding reception décor doesn’t need to be complicated and it doesn’t need to break the bank! With some creative substitutions and a focus on the overall feel rather than the tiny details, you’ll find that decorating your wedding reception on a budget is actually easier than you think. Here are our best tips to make your vision come to life while keeping your wallet happy! 1. Use items from your own home. 2. Repurpose your ceremony décor. Reusing décor elements throughout your day is a major time saver, money saver, and stress saver! Your bridesmaids bouquets can easily become your table centerpieces. Your ceremony backdrop would look gorgeous behind your cake table. You could even use your ceremony seating as part of your reception seating. There’s no reason you should have to spend money on duplicate items, especially if your budget is tight. Want a couple more examples? Here are 5 clever ways to repurpose your wedding décor from ceremony to reception! 3. Use lots of candles. It might sound silly, but never underestimate the power of some good, ol’ fashioned candlelight! Low lighting scattered across a room can really set the mood and give the entire space a pretty glow. Plus, if you get candles in various shapes, sizes, and heights, you can add visual interest to your décor for basically nothing. We love the idea of mixing and matching candles in lanterns, in votive holders, in candlesticks, and on their own for even more depth and texture! Note: You should double-check with your venue to make sure they allow open flames in the space (because some don’t as a fire safety precaution). 4. Think outside the box for centerpieces. There’s no rule that says your table centerpieces have to be floral arrangments — or that flowers have to be included at all! Books, mismatched glassware, lamps, lanterns, and geometric gold table décor are all great centerpiece options. Look around your house…are there things on your tables that you could use for your centerpieces? With a little creativity, the possibilities are endless! 5. Hang lights anywhere and everywhere. It’s amazing how lighting can truly transform a space, which is a huge plus when decorating on a budget. Whether your wedding reception will be taking place outside or inside, you can instantly add romance and coziness with strategically hung twinkle lights or cafe lights. If your wedding reception will be outside, wrap lights around trees, drape them like a canopy between branches, or light up walkways. If your wedding reception will be inside, hang lights from the ceiling, lay them down the center of every table, or incorporate them into potted plants around the perimeter of the space. Pro Tip: If time allows, buy twinkle lights in bulk after Christmas when everything is on sale! 6. Fill out your décor with pretty greenery. We’ve said it once and we’ll say it again and again…greenery is the unsung hero of wedding décor! Whether it’s garlands of eucalyptus, giant tropical leaves, potted ferns, or olive branch wreaths, greenery has the power to add life and a sense of natural elegance to wedding décor without the large price tag of flowers. The best part is that you can add greenery just about anywhere and it will look great: on the backs of chairs, down the center of tables, even on the ground! Not sure if you believe us? Here are 65 times greenery wedding décor proved less is more! 7. Rent as much as possible. Wedding rentals are a budget-conscious couple’s best friend! Seriously, you can rent almost anything for your wedding these days, at a fraction of the cost of buying it straight out. 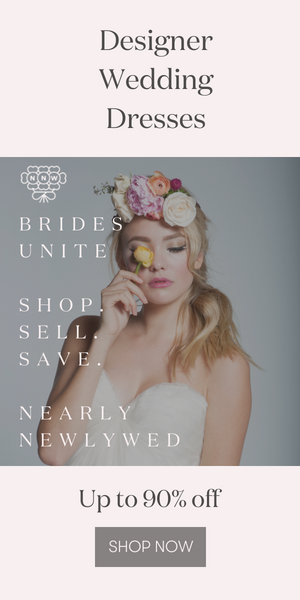 As a bonus, you will save time and money not having to find everything yourself, and you don’t have to worry about transportation on the day of the wedding! If you still need convincing, check out these 4 major benefits of hiring a rental company for your wedding day. 8. For items you can’t rent, shop secondhand. While you should be able to rent most items for your wedding reception, there may be unique items that you simply can’t rent. Rather than buy those items new, save some money by shopping secondhand stores. You would be amazed what you can find at your local thrift stores or even flea markets — and nobody will be able to tell the difference! While you’re shopping, keep an eye out for pieces that you would want to keep for your home (win-win) and keep track of items you could easily resell after the wedding. 9. Make big statements with select pieces. The little details tend to be the ones that add up very quickly. So, rather than try to incorporate a dozen different design elements into your wedding reception décor, focus on one or two big items that will have a large impact on the look and feel of the space. It could be an eye-catching seating chart, a floral arch behind the sweetheart table, or even a beautifully decorated bar area. By focusing on one or two big items, you’ll be able to create that “wow” moment for your guests without breaking the bank! Ready to start planning the music for your wedding reception? Here are 56 unique wedding songs to really set the mood!